A 6-metre long, 2.4-tonne model of the final design of the autonomous and fully electric container vessel Yara Birkeland was revealed as testing commenced at SINTEF Ocean’s 80 metre test tank facility in Trondheim September 28th 2017. It was also revealed yesterday that ENOVA, a Norwegian government enterprise responsible for promotion of environmentally friendly production and consumption of energy will support the project with a NOK 133 million financial contribution. As announced May 9th 2017, Yara and KONGSBERG have partnered to build the world’s first autonomous and fully electric container vessel. Yara Birkeland, named after Yara’s founder Kristian Birkeland, will enable a reduction of 40,000 road journey’s from Yara’s Porsgrunn fertiliser plant in southern Norway to the ports of Brevik and Larvik, significantly reducing local NOx and CO2 emissions produced by haulage trucks. The vessel will be delivered and begin first tests and operations early 2019, and conduct fully autonomous operations in 2020. “To succeed with a project like this we rely on collaboration with leading maritime competence hubs and technology companies, like KONGSBERG on autonomous technology, Marin Teknikk on ship design and SINTEF for testing of the model. It was a special moment when we were joined by our partners in Trondheim today to witness the design and demonstration of a miniature Yara Birkeland for the first time,” says President and CEO of Yara, Svein Tore Holsether. Following the announcement in May, the vessel has been designed at Norwegian design and engineering company Marin Teknikk. A cutting-edge 6-metre long 2.4-tonne model of the final design using technology destined for the real ship, including a fully working thruster system from KONGSBERG, will now undergo comprehensive testing at SINTEF Ocean before construction of the full-scale vessel starts. The decision of where the vessel is to be built will be decided and disclosed by the end of 2017. “Initial tests of the model were successful, proving both concept and the technology. 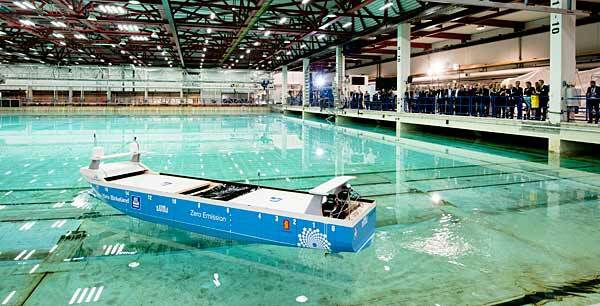 The testing at SINTEF Ocean marks an important milestone in the development. This vessel is important for the entire maritime industry, and Yara deserves praise for their initiative and commitment. Yara Birkeland is the start of a major contribution to fulfilling national and international environmental impact goals, and will be a global milestone for seaborne transportation,” says Geir Håøy, President and CEO of KONGSBERG. Yara Birkeland is a collaboration between the environment-focused Norwegian agricultural company Yara, global maritime technology firm KONGSBERG, DNV GL, Marin Teknikk, SINTEF Ocean and Norwegian maritime authorities. KONGSBERG is responsible for development and delivery of all key enabling technologies including the sensors and integration required for remote and autonomous ship operations, in addition to the electric drive, battery and propulsion control systems on Yara Birkeland. “Green shipping is an area where Norway can make a global difference for climate and the environment, and where the Norwegian maritime cluster can take new international positions. Yara Birkeland will set the benchmark for the application of innovative maritime technology for more efficient and environmentally friendly shipping. The close collaboration between Yara, KONGSBERG and other involved companies and authorities shows the Norwegian maritime industry’s ability to set international standards and lead the way forward,” says Håøy.